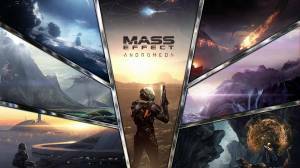 Mass Effect Andromeda is the spiritual successor of the Mass Effect Trilogy and is set to be a standalone game of the series, with in-game references to some of the events and characters of the last games. MEA takes place between the events of the ME2 and ME3. The Citadel council races have devised a joint-plan in venturing to the neighboring Andromeda Galaxy to discover and colonize new worlds. Each race will deploy Arks - massive transport space vessels capable of carrying thousands of selected citizens, in a one-way, 600-year journey to the galaxy. This massive intergalactic operation is aptly called the Andromeda Initiative. After arriving in a designated point, the races will cooperatively build the Nexus, a massive space station that will serve as the hub for the Initiative, and will function as a center of a centralized government and base of operations for Pathfinders, representatives or leaders of each race participating in the Initiative. Players assume one of the twin Ryders, Sara or Scott, young recruits that are part of the Initiative. From waking up from the centuries-long sleep aboard humanity’s Ark called Hyperion to the following events that lead to the young Ryder becoming the new Pathfinder, players will be given the ultimate task of finding new habitable worlds and solving other secrets and mysteries the new galaxy has to offer. Welcome to Supecheat’s unofficial guide for the game. For this guide, we will be using the PS4 version of the game. Since we don’t have early access to the game, we’ll be starting with the retail version of the game. Please don’t mind the mess as we assemble the guide. Our guide will have in-depth coverage with helpful screenshots and HD videos for your convenience. Here’s what the guide will contain. More will be added as we progress in the game. Kindly use the navigation panel on the right side of the page to use the guide. Also, kindly click on the screenshots to view them in full resolution. Basics - Controls, Combat, Tips and Tricks, what you need to get you started. Navigation - The Heleus Cluster has a lot of locations and planets to explore. This will give you a summary of when these locations will be unlocked and the rewards you can get from them. Multiplayer - We’ll be covering the multiplayer basics in this section. Romance Guide - A staple of the series, here’s the section dedicated to know who you can romance. Trophies - Will feature a basic trophy guide to help you get those trophies. 1Two divorced sims and only one can pick up the baby. Please help! !